With the simple counter example from the previous sections, we have seen the basics of using Meiosis. We saw how to use a renderer, how to create a component with meiosis.createComponent, and how to run the application with meiosis.run. We passed renderer, initialModel, and rootComponent to run. We passed view, receive, and ready to createComponent. Now, let&apos;s look at the all the properties that we can use when creating Meiosis components. We&apos;ll also see the sequence in which Meiosis calls each function. If you do not specify a particular property, skip that function in the diagram. The initialModel is passed to the state function. The result of the state function (application state) is passed to the view. If there is no state function, the initialModel is passed instead. Meiosis also passes either the actions object or the propose function to the view function. Meiosis passes the model or application state and the root component to the renderer. Specify the renderer, the initialModel, and the rootComponent when calling the meiosis.run function. If there is a postRender function, it gets called with the view. If there is a ready function, it gets called with the actions object or the propose function. The proposal is passed to the receive function. Meiosis also passes the latest model as the first parameter. The model returned by the receive function becomes the latest model. The latest model is passed to the state function. The result of the state function (application state) is passed to the view. 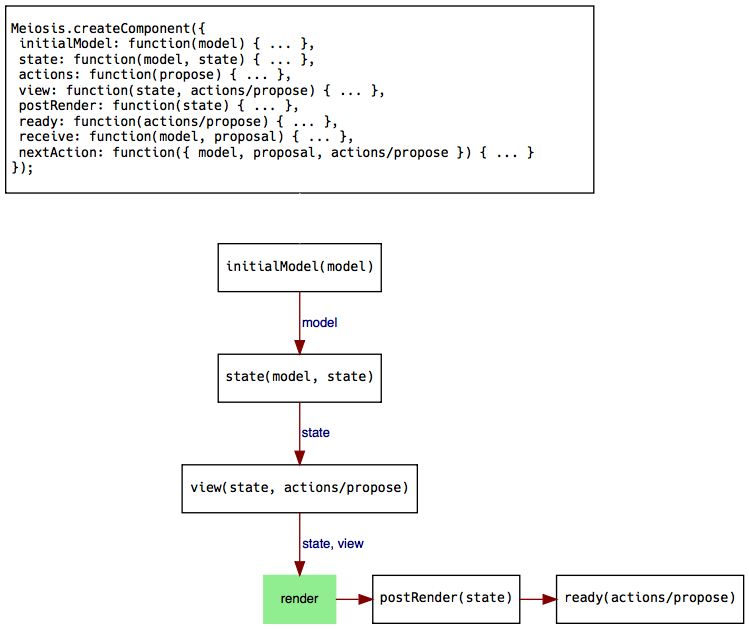 If there is no state function, the lastest model is passed directly to the view function. Meiosis also passes the actions object or the propose function to the view function. Meiosis passes the model and the root component to the renderer. If there is a nextAction function, Meiosis calls it with the model, proposal, and actions object or propose function. 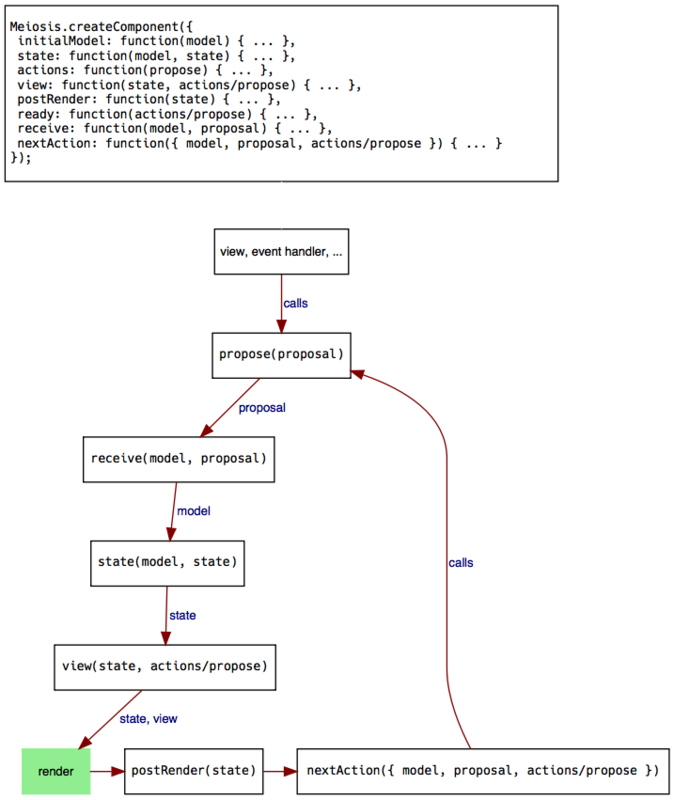 The nextAction function decides whether to trigger another action by calling propose. These diagrams are a cheat-sheet that you can return to for reference. In the following sections, we&apos;ll discuss each property that you can pass to meiosis.createComponent in more detail.